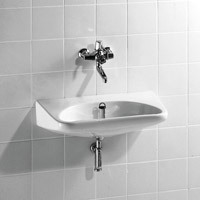 The Keramag Paracelsus wash basin is an ergonomically shaped Keramag wash basin, which is particularly suitable in the barrier-free bathroom or in rehabilitation function rooms. The rounded corners and the wide spout make it possible to support yourself well on the Keramag Paracelsus wash basin, and even the size of the wash basin of 64 x 49 cm is ideal for surgeries. The pore-free glaze KeraTect allows easy cleaning, since germs and bacteria do not find any support on the smooth surface.